It’s not always obvious during the hype and emotion of the game, where a midfielder badly messing up a series of passes and instead booting the ball up the pitch like a Sunday League player perhaps isn’t as obvious as a striker missing an open goal or a ‘keeper dropping one into the back of the net. Take a look, then, at this shocking video of Jordan Henderson highlights from England’s World Cup semi-final defeat to Croatia last night. The Liverpool captain looks rushed and panicked almost every time he gets the ball, and the stats back this up – he finished the evening with just a 73% pass success rate, according to WhoScored. By comparison, the excellent Luka Modric ended the game on 89%, and that’s despite having 86 touches of the ball to Henderson’s 56, according to WhoScored. We wrote in our piece after the game that England need a Modric of their own sooner or later if they are ever to progress in big tournaments. Spain have had a long list of players like this, Germany have Toni Kroos, Italy have Marco Verratti, France have Paul Pogba, but England haven’t had anything like it since Paul Scholes. 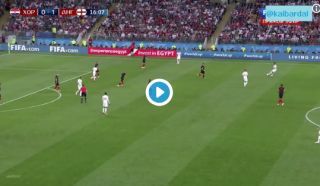 This Henderson video just sums up the gulf between him and someone like Modric, and that’s what urgently needs fixing as England unsurprisingly found that making the final was one step too far for them this summer. At club level, it may already be that Liverpool are planning to replace Henderson after heavy investment in central midfield this summer with the signings of Fabinho and Naby Keita.